Oliver Kenzie explains why having a glass whilst in Greece might provide a stronger link with the past than you might think. SPARE A SIP FOR THE WINE! For most, a great amount of thought no doubt goes into selecting a holiday destination. To be never too far from good wine and good archaeology is usually where I set the bar. I have often found both in abundance in Greece, and my most recent venture proved no different. Visit any archaeological area and you’ll probably still be in striking distance of a taverna – even those situated on paths less well trodden, a glass of the local wine and a couple of olives are never too far away. It serves as a ready reminder of the so-called ‘Mediterranean Triad’, that phrase coined by Sir Colin Renfrew in his influential work The Emergence of Civilisation, that cultivation of grains, vines and olives set the foundation for success in the Aegean during the Third Millennium BC. This humble trio of crops is responsible, in part, for the mesmerising archaeology I take such pleasure in exploring. Of course, I would encourage more archaeology than viticulture, if I had taken in crumbling temple and kokkino krasi in equal measure – I’d have spent much of the holiday incapacitated! But it’s worth sparing a thought, or a sip, for the simple glass of wine, not least as a fantastic connection to have with our contemporaries in the ancient past. And no better place to reflect on two hours under the sun exploring every angle of one my favourite temples, the Temple of Aphaia at Aegina, its glorious corners and brilliant columns, but more on the temple later. My journey started in Athens and wandering around the National Archaeological Museum, it’s hard to miss the quantity of marine scenes from bronze age vessels; wonderful octopuses and diving dolphins. 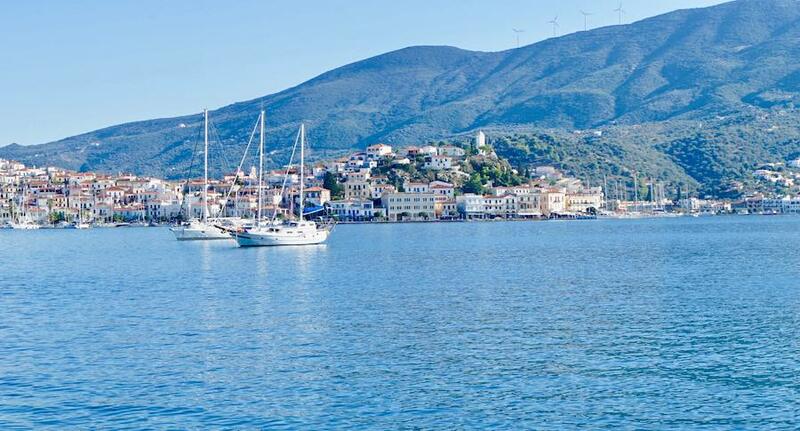 Naturally, Greece’s other great relationship is with the sea, around 6000 islands in all comprise contemporary Greek sovereign territory and the Hellene’s sphere of influence would have stretched further in antiquity. Connections fostered by seafaring were integral for palatial societies in the third millenium alongside the ‘Mediterranean Triad’ and in some ways introduced the next leg of my journey, arriving by ferry in the beautiful Saronic port of Poros, to discover in its charming local museum a cast of the so-called ‘Themistocles Decree’. The marble insciption was discovered by a local farmer who proceeded to use the slab as a doorstep for some time until, in 1959, he donated it to a collection of artefacts being exhibited in a nearby taverna by a local school teacher. 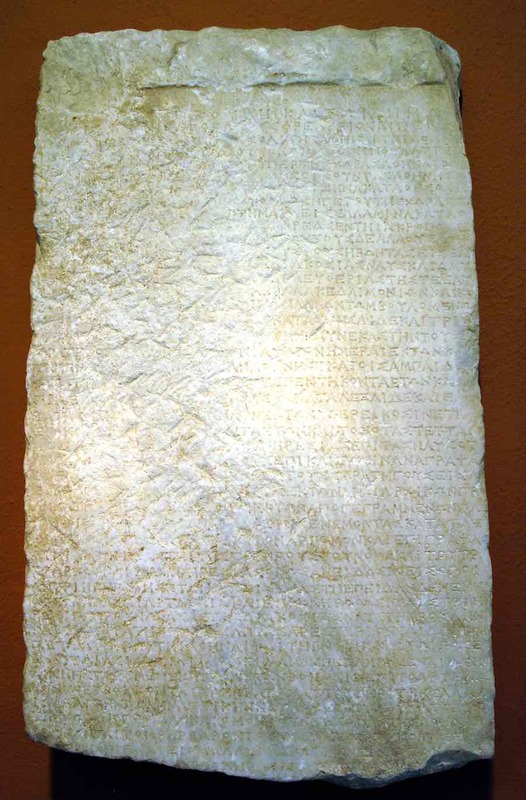 Also known as the ‘Troezen Inscription’, it purports to outline Themistocles’ intention to tactically withdraw from Athens on the eve of the Persian advance into Attica and evacuate the civillian population to Troezen and Salamis. The decree remains academically contraversial, the outline of the Athenian strategy on the inscription contradicts Herodotus’ account, who describes the evacuation of the city as more of an emergency measure than Themistoclean forsight. The rest of the Athenians in their entirety and those aliens who have reached young manhood shall embark on the readied two hundred ships and they shall repulse the Barbarian for the sake of liberty, both their own and that of the other Greeks, in common with the Lacedaemonians, Corinthians, Aeginetans and the others who wish to have a share in the danger. Aeginetans! Back to that temple of Aphaia then on Aegina – the next leg of my journey. The Aeginetans were a great seafaring power during the 6th century BC. Growing rich controlling trade routes to the Levant and the Ionian cities of Asia Minor they were doubtless a competitor in this sphere of the Athenians but nevertheless deployed their ships in alliance to fend off the invading Persians. 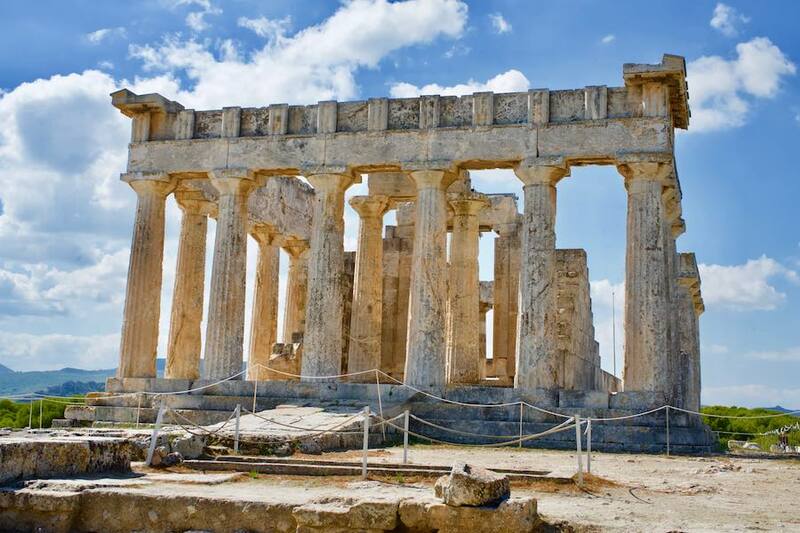 The stunning limestone temple to Aphaia, a deity worshipped almost solely on the island, is remarkably preserved and stands testamant to the Aeginetans maritime success, even if the island state diminished in importance after the Persian Wars. The temple is interesting for many reasons and for those, like myself, who have dedicated research to the development of Temple architecture in Greece, a very special place. After an earlier temple was destroyed by fire, the surviving structure dates to c. 500 BC, a time at which artistic and architectural language was transitioning from the more stylised Archaic period into the increased naturalism of the Classical. The two sets of pedimental sculptures, now exhibited in Munich’s Glyptotek Museum, represent this transitional phase. According to the excavator, the Aeginetans having completed sculptures for both east and west pediments, decided at a later stage to replace the scene on the eastern side with a more complex and up-to-date composition. The result is two sets of extant sculptures, one from the west pediment of late archaic creation and one from the east pediment of early classical date; representative of this artistic transition. The eastern end displays a mastery of the human form; the limbs of dying soldiers lie limp and heads rest sunken, in contrast to the ‘archaic smiles’ of the western arrangement and their more static anatomy. Other signs of the ongoing refinement of the Doric form (the canon of architecture popular in this part of Greece) are evident in the sophiticated column capitals, more elegant than their disc-like predecessors and also in the employment of a technique known as corner-contraction. The frieze of the Doric is comprised of an alternating series of members known as triglyphs and metopes, the metopes being the square open blocks, often painted or themselves filled with decorative sculpture, and the triglyphs being the alternating oblong blocks, incised with vertical grooves. 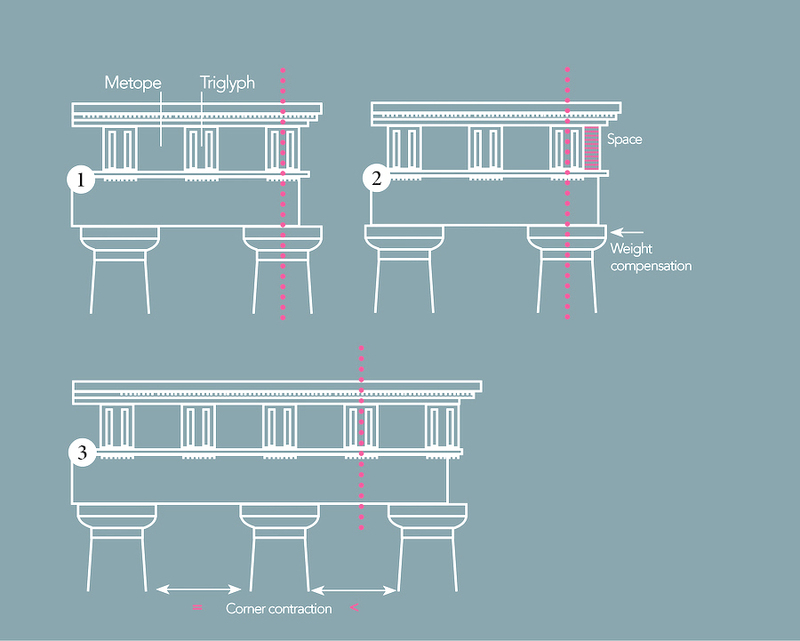 A harmonious composition required that the frieze terminate in a triglyph and that their placement was over the centre of the column and the centre of the intercolumniation (the space between the columns) [Fig. 1]. Oliver will be joining Andrew Wilson for a new tour departing this October to Corinth and the Saronic Gulf. Read more about the departure by clicking on the link below.